During a moment of ardent supplication to God, the great Christian ascetic Macarius of Egypt heard a voice from heaven, saying: "Macarius! thus far thou hast not attained the spiritual level of two women who live in the town nearby!" The elder straightway took his staff in hand and went to seek out the righteous women of whom the voice from on high had spoken. After a lengthy search, he knocked on the door of a certain house in the town, and two women admitted him with kindness. Macarius said to them: "I have left the desert specifically to meet you, that I might acquaint myself with your works. Tell me of yourselves." "O man of God," the women answered, abashed, "can one expect anything God-pleasing from those who are continually occupied with domestic tasks and must need fulfill the responsibilities of marriage?" But the ascetic persisted, asking the women to disclose to him their manner of life. And they answered him, saying: "We are two sisters-in-law, the wives of brethren. For fifteen years we have lived together, and all throughout that time we have not spoken to each other a single word in vexation. We do not have children, but if the Lord will grant them, we will entreat Him to help us raise them in the faith and in piety. We treat our servants with kindness. Many times we have taken counsel one with another as to whether we ought to enter a community of nuns, but our husbands have declined to give us their permission. And seeing their love for us, we have resolved not to part with them, but to serve them with diligence. Yet to make our life a little like that of the holy desert-dwellers, we have set it in our hearts to avoid loud conversations, to remain at home as much as possible, to take care of the running of our household." To this the venerable Macarius said: "Truly God doth not look to see who is a virgin or who is married, who is a monastic or who is in the lay state, but only looketh for the inclination of the heart toward good deeds. This He accepteth, and in accordance therewith He sendeth the Holy Spirit down upon anyone who desireth to be saved. And the Holy Spirit, the Comforter, directeth the thoughts and will of such a one to the everlasting life of heaven." 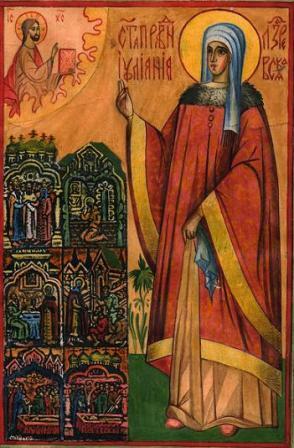 In Russia, the merciful Juliana provided just such a example of piety and spiritual purity as the women had revealed to the venerable Macarius in the East, in Christian antiquity. Her life teaches us that even in the world, even within a family, amid cares for children, spouse and members of one's household, one may please God no less than one who withdraws from the world to a monastic cell: one only need live according to the demands of the love of Christ and the righteousness of the Gospel. The merciful Juliana was born in Moscow, in the palace milieu, to pious and philanthropic parents named Justin and Stephanida Nedyurev. Her father served as the steward at the court of Tsar Ivan IV Vasilievich, known as the Terrible. Justin and Stephanida lived in all reverence and purity, with their sons and daughters, and a multitude of servants, possessed of great riches. Into their family the blessed Juliana was born in the 1530s. When she was six years old, she lost her mother, and was taken to be raised by her maternal grandmother, Anastasia Lukina, and removed from Moscow to the outskirts of the city of Murom. Yet six years later the righteous Juliana's grandmother passed away, leaving the twelve-year old orphan to be raised by her aunt, Juliana's grandmother's daughter, Natalia Arapova, who had many children of her own: eight daughters and one son. It is well known that brothers and sisters do not always live in peace and goodly concord; and it is even more common for disputes and quarrels to arise among more distant kinfolk if they live together. The venerable Juliana honored her aunt, was obedient to her in all and unfailingly humbled herself before her cousins, the children of the household, enduring in silence their insults and reproaches. Yet throughout her life Juliana did not resemble her cousins: she had no love for the games, pastimes and pranks which are the pursuits of youth, but gave herself over to fasting and prayer. This difference in temperament between Juliana and her cousins became the cause of mockery and ridicule not only among her cousins, but also among the servants; and under the influence of her children, Juliana's aunt frequently upbraided her orphaned niece. "O foolish one!" she would often say to Juliana, "why art thou mortifying thy body at such an early age? Dost thou wish to ruin thy virginal beauty?" At times, they had to compel the orphan to eat and drink by force. Yet the meek, quiet and dutiful Juliana always remained steadfast and immovable when the matter concerned the salvation of her soul and the God-pleasing life. The taunts and ridicule of her relatives and servants had no affect upon Juliana: she led the same strict and ascetical life as before. The games and merry songs of her peers held no fascination for her; rather, they provoked in her only displeasure and incomprehension. Since she held herself aloof from girlish amusements and pass-times, Juliana gave herself over with intense commitment to her handiwork: the needlework which flourished in the homes of the nobility in that age, especially spinning and sewing at embroidery-frames. The righteous one spent her evenings in such pursuits. Yet Juliana did not labor for herself: she made clothes for homeless orphans, widows and the sick of her village. And she labored for them indefatigably, without taking sufficient food, drink or rest. Word of her philanthropy spread to the outlying region, and all who heard of it marvelled at her virtuous life. What is particularly striking is that Juliana's exalted humility and boundless love for her neighbors sprang forth only from the depths of her own pure heart, full of Christian meekness. She had no guides and teachers; she was unable either to read the sacred Scriptures or to derive instruction therefrom; during the years of her girlhood she did not even attend church, for there was none nearby. When Juliana reached the age of sixteen, she was married by the priest Patapius to George Ossorgin, a rich merchant of Murom, in the village of Lazarevo, which was on Ossorgin's estate. After the wedding ceremony, the priest delivered to the newlyweds a discourse on how they should live, how they should raise their children in the fear of God, how they should instill virtue in the members of their household and, in general, make of their family a little church. The words of the priest penetrated deeply into the soul of Juliana, and she followed them devoutly all throughout her life. Her father-in-law, Vasily, and her mother-in-law, Eudocia, were wealthy people well known at the court of the tsar, possessed of many servants and several commodious residences. Besides George, their only son, they had two daughters. By her calm and meek character, her personal kindness and welcoming attitude, Juliana won the love not only of her husband's parents, but even of her sisters-in-law, which was unusual for those times. Distant kinfolk of the Ossorgins and close friends of the family all fell in love with her. They asked her various questions, so as to obtain some idea of her character, but she disarmed her questioners with her constant kindness and goodness, her meek and soft replies, and little by little won the love even of those who at first were reluctant to extend their regard to her. Thus Juliana came to occupy the most visible place in the family of her husband, and became the mistress of the household. The cares and concerns of the household and its economy did not take up all the attention of the blessed Juliana and did not occupy her soul to its detriment: rising early in the morning or resting from the day's cares and turmoil before going to sleep, she would pray long to God and make a hundred or more full prostrations; and she drew her husband to take part regularly in this continual and fervent supplication. George Ossorgin was often summoned to serve in the tsar's army in Astrakhan' and other faraway places, and he was often away from his home for as many as three years. While she was parted from her husband, under the influence of her natural sorrow, Juliana would spend whole nights in prayer, or at her spinning and sewing. The products of her handiwork she would sell, distributing to poor the moneys thus obtained. Moreover, as a skilled seamstress, the blessed one would sew shrouds and donate them to the church. She kept her benefactions a secret from her husband's parents. She would send a trusted handmaid forth at night to distribute her alms. She cared for widows and orphans like a true mother, washed them with her own hands, fed them, gave them drink and sewed clothing for them. She ran a well-ordered household, where everyone knew what tasks he was expected to perform, yet she was always kind and meek with the servants, always addressing them by their full Christian names, never employing nicknames. She never required her servants to wait on her hand and foot: no one poured the water as she washed her hands, no one helped her dress or removed her shoes, as was usual in most of the households of the nobility. If in the presence of guests, as was customary, she had to rely on such ministrations by her servants, when the guests departed she would bow down and say of herself: "Who am I that I should be served by others, who are also created by God?" On the contrary, she was ever ready to serve others herself, and she made certain that her servants had nourishing food and proper clothing. 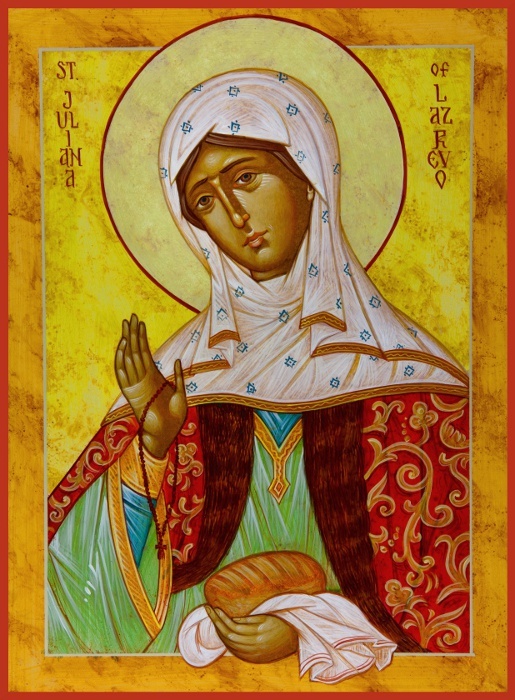 Yet the righteous Juliana was not satisfied merely to look after the food and vesture of her servants: she strove to see that there were no quarrels and arguments among them, so that peace and quiet, and the grace of God, reigned in her home. Whenever quarrels would arise among her servants, Juliana would frequently take the blame upon herself, and thus placate those who were at enmity. Furthermore, she was wont to say: "I often sin before God, and He, being full of loving-kindness, forgiveth me. Therefore, I will be patient with my servants' sins. Even though they are subject to my authority, yet in soul they can be better than me and more pure before God." She never complained about the faults of the servants to her husband or his parents, who scolded the righteous one for excessive leniency. Whenever she lacked the skill and strength to cope with spoiled servants and restore peace and tranquility to the household, she would pray fervently to the all-holy Virgin and to Saint Nicholas the Wonderworker, asking their help. During one such trying time, while Juliana stood in prayer at night, the demons struck fear into her heart. She fell senseless upon her bed and plunged into a deep sleep. In a dream she saw a multitude of unclean spirits advancing upon her with swords. "If thou dost not stop what thou art doing," said the demons, "we will destroy thee forthwith!" 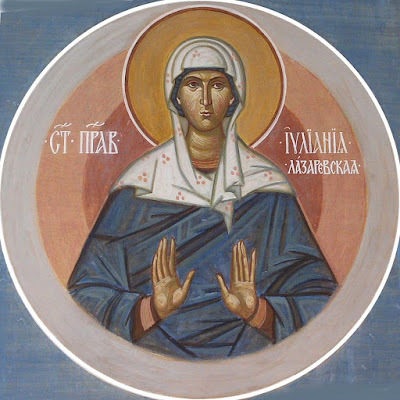 The blessed Juliana cried out in prayer to the Mother of God and Saint Nicholas, and the holy wonderworker appeared with a large book and drove away the dark spirits, who vanished like smoke. After this, he blessed the merciful Juliana and said: "My daughter, be of good cheer and be strong. Fear not the wiles of the demons. Christ hath commanded me to defend thee against demons and evil men." When she awoke, Juliana clearly beheld a radiant man, who passed through the door of her bed-chamber and disappeared. She ran after him, but the bolts and bars of her quarters had not been moved. Then Juliana understood that the Lord had indeed sent her a heavenly protector: she was strengthened in her faith and hope in the help of God, and with yet greater diligence continued her works of almsgiving and love for her neighbors. It happened that, in the year 1570, a great famine struck the Russian land, and multitudes of people died from lack of grain. The merciful Juliana drew supplies from her mother-in-law, ostensibly for her own breakfast and noon meals, but secretly distributed all to the starving and poor. Her mother-in-law was amazed at this, and said: "I rejoice that thou hast begun to eat more often, yet I am astonished that thou hast altered thy usual habit. Before, when there was plenty of everything, thou didst take no food in the morning and at noon, and I was unable to prevail upon thee to do so. But now, when there is everywhere a shortage of bread, thou takest both breakfast and the noonday repast." So as not to disclose her secret almsgiving, the blessed Juliana replied to her mother-in-law: "While I had not yet given birth to children, I had no desire to eat those meals; but now I have become weak from birthgiving, and I wish to eat not only during the day, but also at night. But I am ashamed to ask you for food at night." Juliana's mother-in-law was delighted that her daughter-in-law had begun to eat more, and began to send her food even at night. The merciful Juliana accepted the food and distributed it all in secret during the famine. When any of the poor of the surrounding area would die, she would purchase a shroud and provide funds to cover the cost of the funeral. She prayed for the soul of everyone buried in the village of Lazarevo, whether known to her or not. When the famine passed, a new misfortune befell Russia: a deadly contagion descended upon the hapless land. Filled with horror, the people shut themselves up in their homes and would not allow those infected with the plague to enter; they were even afraid to come in contact with their clothing. Yet the merciful Juliana, unbeknownst to her husband's parents, would wash the sick in the bath-house, treat them as far as she was able, and besought the Lord for the restoration of their health. And whenever any orphan or pauper died, she would wash him with her own hands and hire someone to help bear him away for burial. The parents of Juliana's husband died at an advanced age, and, according to the custom of their forebears, received the monastic tonsure on their death-beds. Juliana's husband was not at home at that time: he had been serving in the tsar's army at Astrakhan' for more than three years. 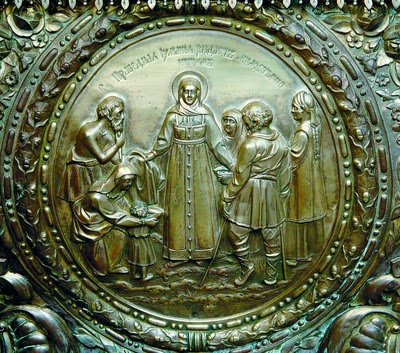 The blessed Juliana buried Basil and Eudocia Ossorgin with honor, distributed lavish alms for the repose of their souls, had requiem liturgies celebrated each day for forty days, set forth tables of foodstuffs for the monks, priests, widows, orphans and the indigent, and also dispatched abundant donations to the prisons. And afterwards, every year, she kept the memory of her husband's depart parents and expended a sizeable portion of the family's revenue on this good work. The blessed Juliana lived peaceably and quietly with her husband for many years, and the Lord gave her ten sons and three daughters. Of them, four sons and two daughters died in childhood. Her remaining children she raised, finding joy in them. But when her children grew to adulthood, the enemy of the human race sowed enmity between them and the servants of the blessed one, despite her desire to bring about peace between the disaffected. Her eldest son was even murdered by a servant; and not long afterward, her second son was killed while serving in the tsar's army. A bitter burden were these tribulations to Juliana's maternal heart, yet she did not cry aloud, she did not tear the hair from her head as other women were wont to do: unceasing prayer and almsgiving strengthened her powers. Her husband also grieved over the loss of his sons, but the blessed one consoled him. Under the influence of these familial misfortunes, Juliana began to press her husband to permit her to retire to a convent, and she even let it be known that she was prepared to depart secretly, but George reminded her of the beautiful words that the priest had spoken at their wedding, and the admonitions of other fathers: "Black garments will not save us if we do not live monastically, and white garments will not destroy us if we do what is pleasing unto God. If anyone departeth to a monastery, not desiring to care for children, he seeketh not the love of God, but rather peace. And the children, orphaned, will often weep and curse their parents, saying: 'Wherefore, having given birth to us, hast thou left us in tribulation and suffering?' If it is commanded to feed the orphans of others, it followeth that one ought not to starve one's own children!" The husband of the righteous Juliana was a lettered man. And he read to her other passages from spiritual writers until he had persuaded her. And she said to him: "Let the will of the Lord be done!" After this, husband and wife began to live as brother and sister. George continued to sleep in his usual bedroom, but Juliana lay down on the stove in the evenings, spreading firewood, branches uppermost, to sleep on instead of a bed, and positioning her ring of iron keys beneath her side. Thus she would fall into a slumber for an hour or two. When the house grew quiet, the blessed Juliana would rise for prayer, and would often spend whole nights in supplication; in the morning she would go to church for matins and liturgy. After the divine services, the merciful Juliana would return home and occupy herself with the running of her household. On Mondays and Wednesdays the blessed one would eat but once a day, and on Fridays she would take no food at all, but would withdraw into a separate room, setting up in her home the semblance of the cell of a monastic recluse. And she would permit herself only a single cup of wine on Saturdays, when she fed the clergy, widows, orphans and poor. Ten years after she and her husband suspended their marital relations, Juliana's husband died. When she had buried and commemorated him according to custom, as she had her husband's parents, the merciful Juliana gave herself over wholly to the service of God and the poor. Since her children grieved mightily over the loss of their father, she consoled them, saying: "Be not sorrowful, my children! The death of your father is for the edification of us sinners. Seeing it, and continually expecting our own departure from this life, be ye virtuous. Above all, love one another, and give alms." And the blessed Juliana did not teach by means of words alone: she strove also to emulate by her manner of life the great Christian strugglers, the holy women of whom her husband and other literate people had read to her. Whenever she was free from domestic concerns, the blessed Juliana gave herself over to prayer and intensified her fasting. Yet she concerned herself most of all with almsgiving. Often she would have no money left to distribute to the poor. In wintertime she would receive money from her children to buy warm clothing for herself, but she gave it all to the poor, and she herself went about in thin garments and barefoot. In order to struggle for the Lord in ascetic labors, and, experiencing pain, to fan the flame of her prayer to God, the Bestower of joy and consolation, she placed broken nut-shells between her bare feet and her sandals, and thus walked about her house. One year, there was an exceptionally cold winter, so that even the ground froze through and cracked. Juliana came down with a cold and did not attend church for a time, but she prayed at home. One day, the priest of the village of Lazarevo came to church early in the morning and heard a voice issuing forth from the icon of the Theotokos, saying: "Go and ask Juliana the merciful why she hath not been coming to church. Her prayer at home is pleasing unto God, yet not as pleasing as supplication made in church. And do ye render homage to her: she hath passed the age of sixty, and the Holy Spirit resteth upon her!" Filled with awe and fear, the priest hastened to Juliana, fell at her feet, asked her to forgive him, and told her of the vision he had witnessed. The blessed one was greatly saddened and said to the priest: "Thou hast surely fallen into temptation to say these things! How can I, a sinner before the Lord, be worthy of such a call?" The priest promised Juliana not to speak of his vision while she was alive, but declared that he would make it known after her repose. Then Juliana went to church; there she had a service of supplication offered before the icon of the Mother of God, and she kissed it and entreated the heavenly intercessor with tears. The blessed one's widowhood lasted for ten years, during which she distributed practically all her possessions to the poor. She retained for her household only what was most necessary and arranged that her supplies of stored food not be carried over from one year to the next. All that remained from the year's stores she immediately passed on to the poor, the orphans and indigent. Then came the hapless reign of Tsar Boris Godunov (1598-1605), and the Lord punished the Russian land with a famine of unusual intensity: the starving people even had to resort to eating carrion, and in certain cases were driven to consume human corpses. Countless multitudes perished of starvation. The house of the Ossorgin family was also affected by the dearth food, for the sowers had not gone forth to plant the fields, and even the cattle died from lack of fodder. The blessed Juliana begged her children and servants not to take anything that belonged to others. Everything that remained in her house of clothing, livestock and vessels, she sold, buying grain with the money she received. With these funds she fed her household, and despite the terrible lack, she also helped the poor, so that not one of them departed from her empty-handed. When there was no more grain left, the merciful Juliana did not become discouraged, but placed all her trust on the help of God. Eventually, the blessed one was forced to move to the village of Vochnevo, on the outskirts of Nizhni Novgorod, where some food was still obtainable. Yet even there the famine soon hit with full force, and Juliana, no longer able to feed her servants, set them at liberty. Some of them took advantage of their freedom, but others remained to endure want and grief with their mistress. Juliana ordered the servants who remained with her to gather pig-weed and to strip the bark from a certain species of elm-tree. With these she prepared a type of bread with which to feed herself, her children and servants. Through her prayers, the bread made from pig-weed and elm-bark turned out to be quite tasty, and the poor, of whom there were an extraordinarily great number because of the famine, came in multitudes to receive it from the merciful Juliana. Her neighbors asked the poor: "Wherefore go ye to the house of Juliana? She and her children are barely alive in their hunger!" But the poor answered: "We have travelled through many villages, and sometimes we have been given pure wheat-bread; but we have never tasted bread as sweet as that given out by this widow!" The neighbors, who had quite a store of pure wheat, sent to ask Juliana for some of her pig-weed and elm-bark bread, and they were convinced that it was indeed very sweet; yet they attributed this to the skill of the servants who prepared the dough. While enduring grievous want for two years, the righteous Juliana was not troubled, did not resort to grumbling and complaints, did not become despondent, but was of good cheer and as joyous as was her wont. One thing alone gave her cause for sadness: there was not a church in the village of Vochnev, and because of her advanced age she was unable to visit the church in the nearest village. Yet mindful of how the domestic prayer of the centurion Cornelius was pleasing to God [Acts 10: 31], the blessed one gave herself over to supplication and quickly found peace for her soul. On the 26th of December, 1603, the merciful Juliana fell ill. Her sickness continued for six days, yet she lay in bed only during the daytime, while at night she rose and stood in prayer without any support. Her handmaidens mocked her, saying: "What kind of a sick woman is this? During the day she lieth abed, but at night she standeth in prayer!" But the blessed one answered those who mocked her meekly: "Why do ye laugh? Do ye not know that the Lord expecteth even the sick to pray?" On January 2nd, when day broke, the merciful Juliana summoned her spiritual father, the priest Athanasius, and received communion of the Holy Mysteries. Then she sat up in her bed and called her children and servants to her. Much did she teach them of how to live a God-pleasing life, and said also: "When I was still a child, I had a strong desire to be tonsured and given the great angelic habit, yet I was not deemed worthy of this, because of my sins. Glory to the righteous judgment of God!" She ordered a censer prepared for her burial and incense placed in it, and having bidden farewell to her children, handmaid and friends, she stretched out upon the bed, made the sign of the Cross thrice over herself, wrapped her prayer-rope around her hands, and uttered her last words: "Glory to God for all things! Into Thy hands, O Lord, do I commit my spirit!" When the blessed one reposed in the Lord, everyone present saw how a splendid light formed around her head in the guise of a golden crown, such as one sees on the icons of the saints. When they washed the body of the newly-departed and had it placed in a separate storeroom, at night they saw burning candles (although no one had lit them), and sensed a sweet fragrance emanating from the room where the blessed one lay. 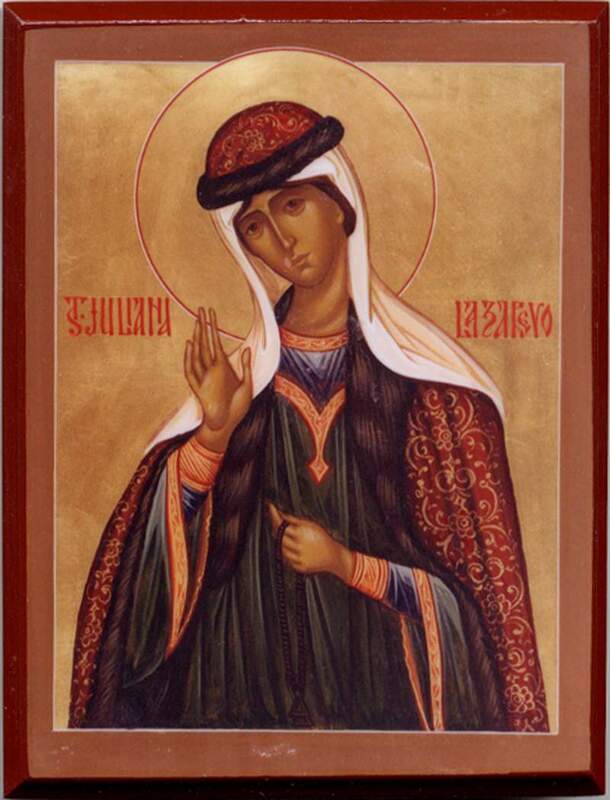 During the night following on the day of the her repose, the merciful Juliana appeared to one of her handmaids and ordered her to see that her body was carried from Vochnev to the Murom region and buried by the church of the righteous Lazarus, next to that of her husband. The body of the blessed, which had seen so many labors, was placed in an oaken coffin and borne away to the village of Lazarevo, about three miles from Murom, and was there interred on January 10th, 1604. In the years to come, the children and kinfolk of the merciful Juliana erected a winter church, dedicated to the Archangel Michael, over her gravesite. On August 8th, 1614, the blessed one's son George died, and as they began to prepare a burial place for him in the crypt of the Ossorgin family, they found the coffin of the blessed Juliana intact, though they were unaware of the identity of the coffin's occupant. On August 10th, after George's funeral service, when those who had taken part in the ritual went to the house of the Ossorgins to commemorate the departed, the curious women of the village opened the coffin and saw that it was full of fragrant myrrh. When the guests left the commemorative meal, the women reported what they had seen to the Ossorgin family. The children of the merciful Juliana hastened to the coffin and saw that the women's report was true. In reverent fear they took away a small vessel of the myrrh and carried it to the cathedral of Murom, probably as evidence of their report. During the daytime this myrrh was like unto the juice of beets, but at night it thickened and became like attar exuded by some purple flower. 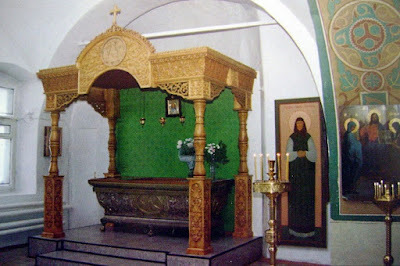 In their awe they did not dare to inspect the whole body of the righteous Juliana: they saw only that her hands and legs were intact; they did not see her head, because a beam which supported the church's furnace lay across the lid of the coffin. That night, many heard a bell ring in the church of the righteous Lazarus, and they hastened to the church, thinking that someone was sounding the fire tocsin; yet there was no conflagration to be extinguished anywhere. Those who arrived noticed that a sweet fragrance was being emitted from the coffin. Word of this happening spread quickly to the outlying areas, and many came to the saint's coffin, anointed themselves with the myrrh and received healing for their divers ailments. When the myrrh had been almost completely distributed, the sick began to take the sand from beneath the coffin of the merciful Juliana, rubbed it on themselves and, according to the measure of their faith, received the alleviation of their infirmities. Thus, Jeremiah Chervev, a resident of Murom, went to the coffin of the merciful Juliana with his wife and two sick children. His son and daughter were afflicted with a disease which had caused blood to flow from their hands and feet for more than two years, and they were unable even to lift their hands to their mouths. Having had a service of supplication and a panikhida chanted at the coffin of the holy Juliana and rubbed some of the sand upon their children, Jeremiah and his wife returned to their home. Their children slept for a full day and night, and when they awoke they were able to make the sign of the Cross freely. Within a week their health had been completely restored. A peasant from the village of Makarova suffered from a terrible dental affliction and had long been unable to eat, drink or work. On the advice of his wife, he went to the coffin of the merciful Juliana alone at noon-time, prayed to the blessed one, rubbed some of the sand on his teeth and returned to his home well. One night, a fire broke out in the village of Lazarevo and consumed four lead-roofed cabins. An extraordinarily powerful wind was blowing, and the fire gradually grew closer to the church. The priest ran to the church, hurriedly took soil from beneath Saint Juliana's coffin in both hands, and cast it at the fire. The wind then changed direction, the fire died down little by little, and finally went out. A peasant from the village of Koledino, by the name of Clement, had an abscess on his leg which gave him much discomfort. The sick man, having heard of the miracles wrought by the blessed Juliana, asked his friends to carry him to her coffin; there he had a service of supplication offered, rubbed soil from the saint's grave on his ulcer, and quickly received a cure. Maria, a servant of the nobleman Matthew Cherkasov, who lived in a suburb of Murom, became blind. When her friends and family brought her to the shrine of the holy Juliana and had a service of supplication and a panikhida offered up for her, she sensed that her sight was returning. On the way back to Murom she was even able to pick mushrooms and berries. A certain ten-year old boy became paralyzed and lost his sight. He was carried to the Church of the Archangel Michael, where a service of supplication was offered up to the righteous Juliana, and the sick child suddenly could see a burning candle; in a short time he completely regained his health. Agatha, the wife of Theodore, a clergyman who served in the Church of the Archangel Michael, contracted a condition of the hand which was so painful that she was unable to move it. 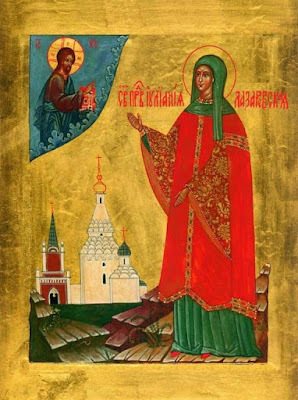 The merciful Juliana appeared to the unfortunate woman and said: "Go to the Church of the Archangel Michael and kiss the icon of Juliana." Then the saint identified the place where the sick woman had hidden two coins and commanded her to give them to the priest to touch to the icon. The ailing woman did all that she was told: she had a service of supplication and a panikhida offered, drank holy water, rubbed the sand on her hand, and was healed. Joseph Kovkov, a courtier of Moscow, was grievously ill, to the point where it was expected that he would soon die. But the thought came to him to have his servant Anicius go to the shrine of the righteous Juliana. The servant had a service of supplication offered up for the health of his ailing master, and took with him holy water and sand. When Kovkov sprinkled himself with the water and rubbed himself with the sand which had been brought to him, he immediately recovered his health. 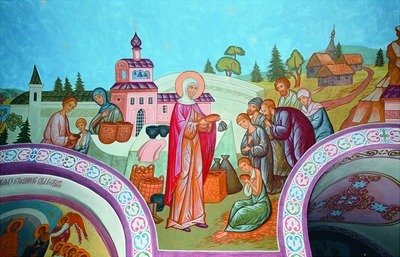 The cured man then travelled to the village of Lazarevo on foot, to give thanks to the merciful Juliana. Shining forth with grace divine, even after death thou hast revealed the radiance of thy life; for thou pourest forth fragrant myrrh for healing, upon all the sick who approach the shrine of thy relics with faith. O venerable mother Juliana, entreat Christ God, that our souls be saved. All of us amid misfortune and pain hymn the holy Juliana as a helper quick to hear; for she lived a God-pleasing life in the world and gave countless alms to the poor. Wherefore, she hath found the grace of miracles at the command of God.